Dr. Karlease Kelly serves as the Provost of the USDA Virtual University and Deputy Chief Human Capital Officer for the U.S. Department of Agriculture Office of Human Resources Management, Departmental Management. Dr. Kelly provides vision and leadership and coordinates with all USDA Training Officers and human resources professionals on talent development policies and programs. This includes managing USDA’s Senior Executive Service Candidate Development Program, and overseeing USDA’s implementation of Federal training policies such as mentoring, individual development planning, details, new supervisor training, experienced supervisor training, developing the leadership pipeline, executive development, and programs to increase employee engagement and satisfaction. In November 2015, she was elected to serve as the Chair of the Federal Chief Learning Officers Council. Under her leadership, USDA moved up 7 places in the Best Places to Work Rankings from 2013 to 2016, from 16th of 18 large agencies to 9th place, gaining recognition as the most improved large agency. The Virtual University achieved the Bronze Learning Elite Award provided by the Chief Learning Officers magazine in March 2016. Additionally, the Virtual University received first place for the category of Best Leadership Development Program in 2014 from the Human Capital Management Government Conference based on ratings from a panel of peers, as well as third place for Driving Employee Engagement for the category of Workforce Development Program, and third place for USDA’s 360 Degree Assessment Program in the category of Public Sector Innovation in 2015. Dr. Kelly is a member of the American Council for Technology-Industry Advisory Council on human capital management. Prior to this, Dr. Kelly served in USDA’s Food Safety and Inspection Service (FSIS) as the Assistant Administrator for the FSIS Office of Outreach, Employee Education and Training. 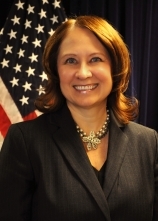 In this position, she was responsible for developing the knowledge and skills of Agency and State employees, as well as conducting education and outreach activities to meet the needs of small and very small meat, poultry and egg processors to help them enhance their food safety and food defense systems. Under her leadership, FSIS became an Authorized Provider of continuing education units, and received the Exemplar Award from the International Association of Continuing Education and Training (IACET). She worked collaboratively with employee unions and associations as well as universities to partner with them in providing educational services to Agency employees. Additionally, she created and administered an assessment center for leadership development. She spoke at a number of industry meetings about improving workforce training for government and industry employees. Dr. Kelly also established the Small Plant Help Desk to respond to questions small meat and poultry manufacturers about providing updated training to employees on food safety policies. The Government Accountability Office (GAO) highlighted the FSIS outreach program serving small and very small plants as unique in providing helpful resources and assistance to small businesses (GAO report 07-714). FSIS training programs contributed to the Agency winning the 2007 President's Quality Award for the Strategic Management of Human Capital.